Well, it's either feast or famine in the genealogy game, isn't it? 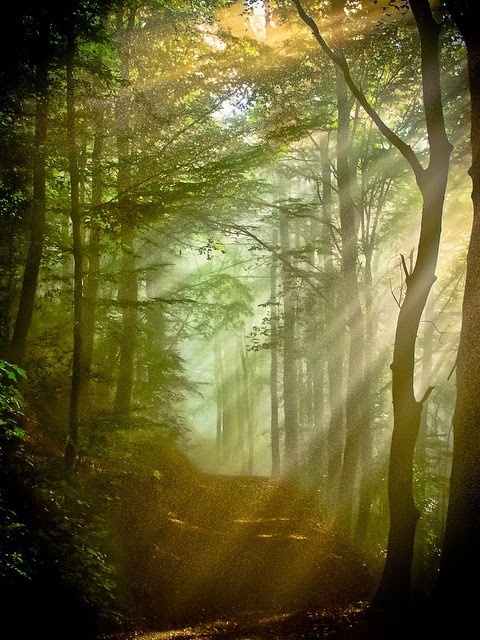 There are long dry spells sometimes, when you think nothing's ever going to happen again. But don't lose faith -- keep putting the work in, keep putting the feelers out, and eventually, something will come up. 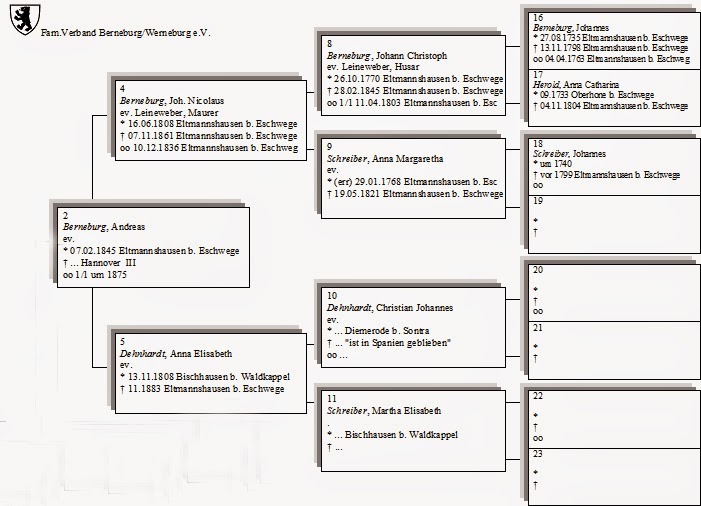 A while ago, I learned that there's a Familie Verband Berneburg/Werneburg (Family Association for Berneburg/Werneburg) in the city of Eschwege in Germany. 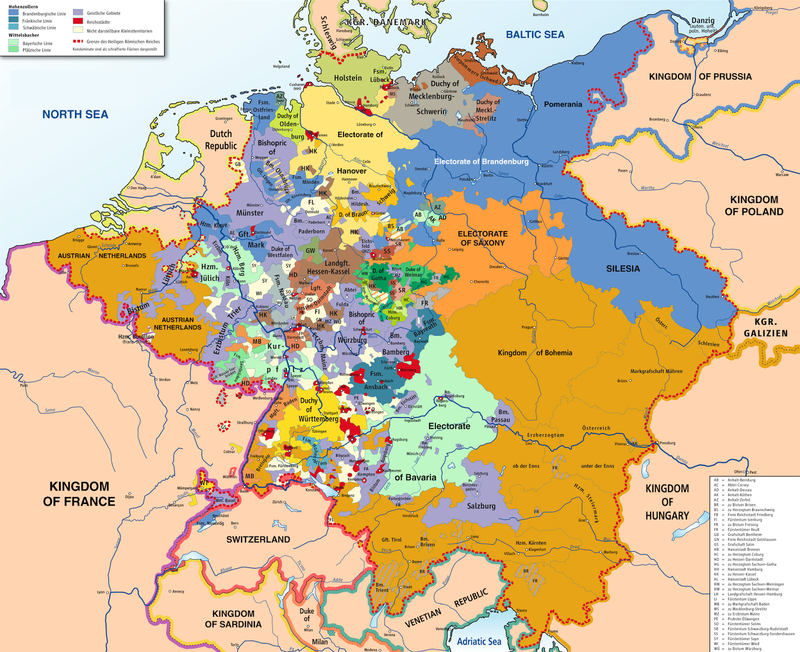 Getting in touch with them was on the back burner for a while, but about a month ago I finally got around to emailing them, telling them my mother was a Berneburg, and wondering if they could help me get any further with my Berneburg line. Today a member of the Verband emailed me, apologized for the delay, and sent along three pages of family tree information on our ancestors. Here's just part of one of the pages. It took me all morning to transcribe the information into Ancestry.com, but it was so much fun to see our family go farther and farther back. The information also included occupations for some of the people: stonecutter, mason, customs official, wagon maker, and several weavers, which adds to the one we have in the Langer line. It includes some wives and a bit of their families, but overall it's just a straight shot down the Berneburg line. 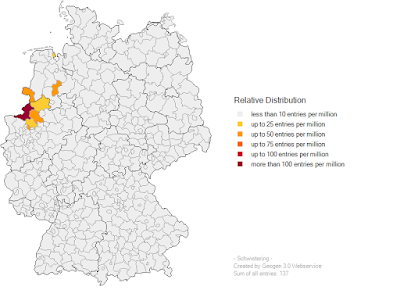 The darker the color is in a particular area, the more Berneburgs live there. See where the very darkest part of the map is? That's exactly where all these ancestors were living. Pretty cool. So there you go. Have faith, keep plugging along, and you might just wind up with your 11th great-grandfather before you know it! Many thanks to the Berneburg Family Society for opening up and filling in a new part of our tree!